Last week was a treat, as the long-awaited start of the annual rains cleared away the thick smoke from the distant Camp Fire. On Tuesday, the air still smoky, I took an afternoon to check in on a few of our streams at their dry-season minimum. Then on Saturday I came back. 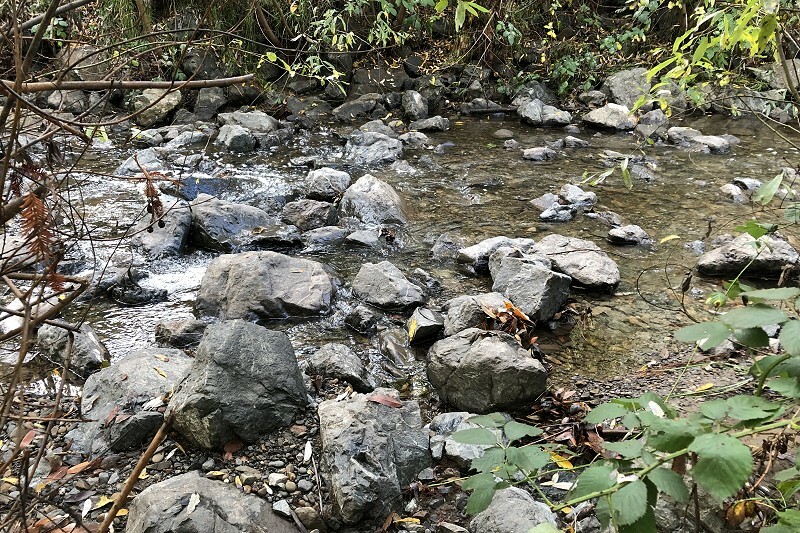 In Dimond Canyon Park, the new improved Sausal Creek was especially impressive in its reawakening. In truth, it was never asleep. We did cosmetic surgery on it without anesthesia. Now, as the rainy season proceeds, we need to watch the bandages. 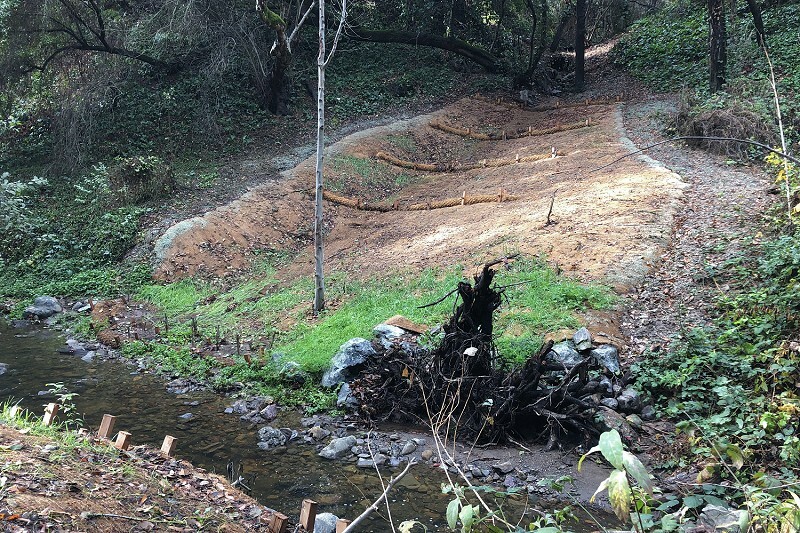 Sausal Creek has had a lot of work done in Dimond Park. 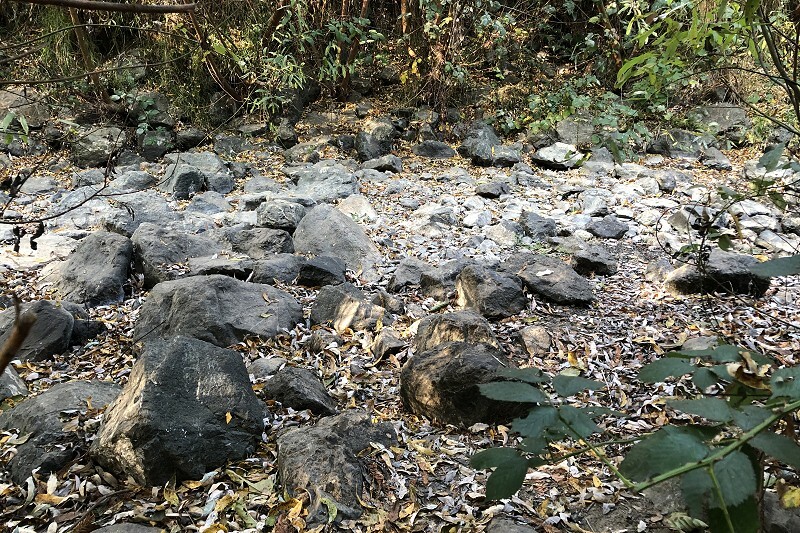 The streambed in the park proper, west of the swimming pool, was cleaned out in 2015 and planted in willows — fitting for a creek of its name. In just two rainy seasons, they’ve grown at a prodigious rate. Now the stream is mostly hidden, but that’s good. To be pleasing for fish, the water needs shade — that keeps the water cool, able to hold more oxygen — and the new thicket keeps out most of the people and their dogs (although I did see a housecat perched on the rocks). On Tuesday there was precious little water there. It was like everything was holding its breath. Saturday I could hear the water long before I saw it. A wonderful sound. Even the sterile new section, built after daylighting a stretch that was culverted in 1952, felt like it was ready to burgeon. Here, just downstream from El Centro Avenue, I could walk up the streambed on Tuesday. . .
. . . but not on Saturday. The latest surgery is higher up the stream, in Dimond Canyon proper. It involves three watershed wounds, carved by undesirable runoff from the streets around the canyon. Too much sediment washes into the creek for the rainbow trout who live there (I had no idea they’d survived all this time). Remediating the effects of heavy runoff isn’t a job done by eyeball with a shovel and wheelbarrow. It’s work that calls for heavy equipment, done with surgical care and designed by geotechnical pros. It’s supposed to last as long as the land itself. It’s supposed to heal over with real vegetation and fool the wildlife. 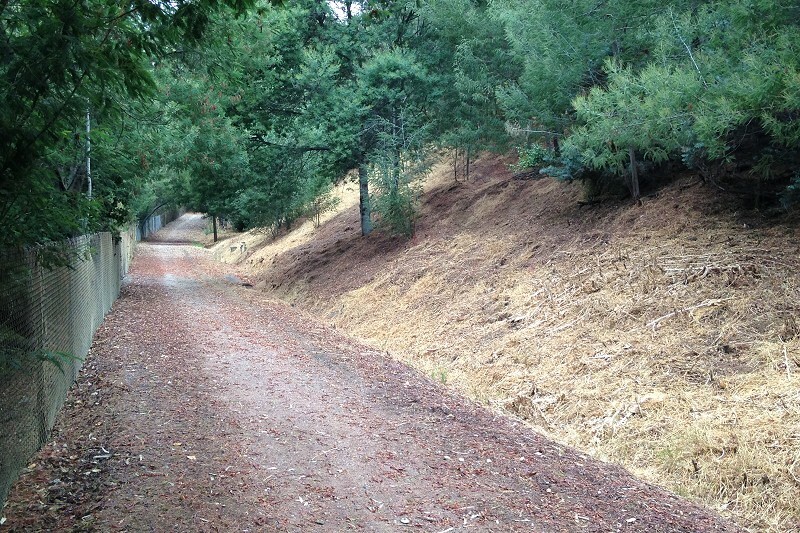 At this site, the object is to keep runoff from carving a gully down the slope. 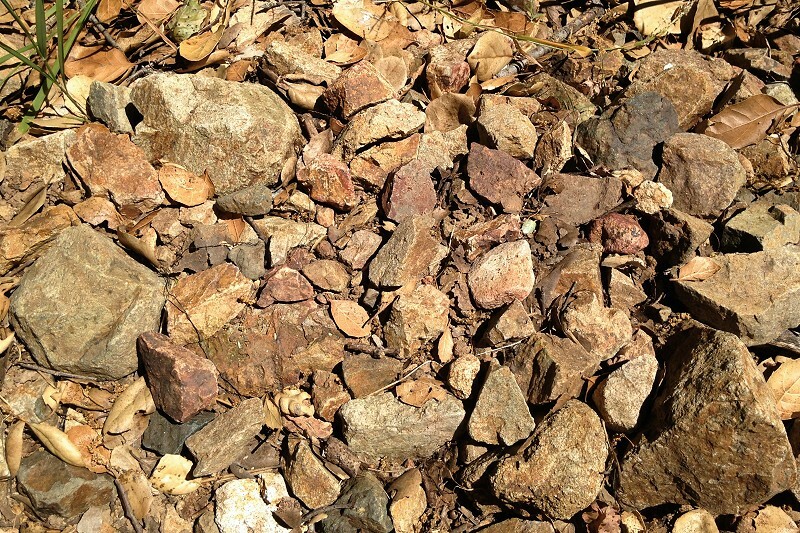 When runoff is modest, it can soak through the channels of stones at the top left and trickle downhill gradually. In a heavier rainstorm, the channels will guide the water aside instead of dumping it all straight down. 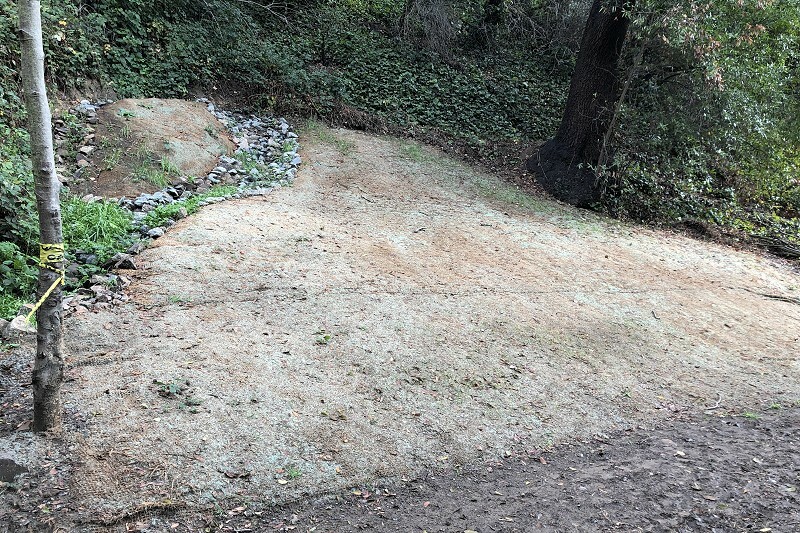 The ground is covered with geofabric, a coarse burlap, and strewn with seeds ready to sprout and offer the slope more protection. More substantial native plants, like dogwood, will be added. The most ambitious part of the project gave a makeover to a long gully reaching the creek from a street drain on San Luis Avenue. This is just the bottom end, below the Old Cañon Trail. It was ugly. Now it’s raw — the work was finished in September. But it held up fine during last week’s rain, so far so good. The snag of tree roots in the front is meant to be there; dead wood is part of a thriving ecosystem. More shrubs will go along the streambanks where the stakes are. This site is where the most hard-core work was done. A storm drain from the end of Benevides Avenue unavoidably dumps a lot of water here, so the site is strongly fortified without turning it into concrete. 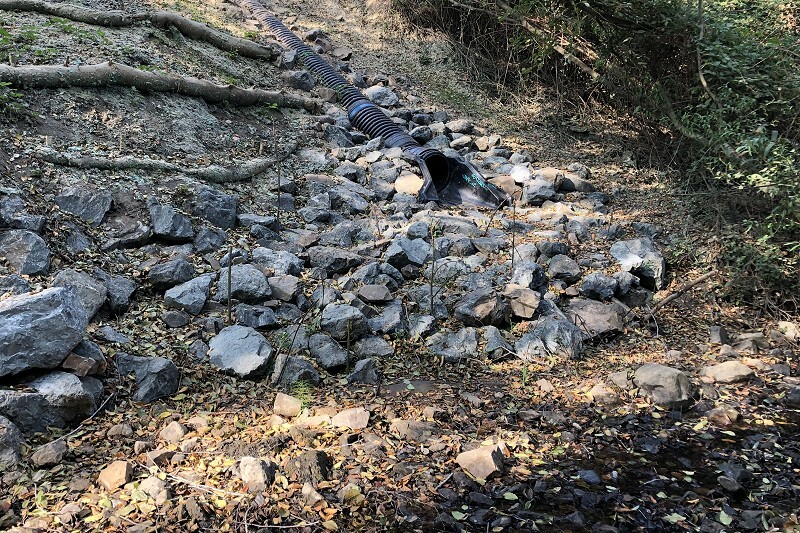 The plastic pipe directs the runoff onto an energy-dispersing boulder pile. The pipe can be repaired as needed without tearing up the rest of the slope. And if you look closely you’ll see thin sticks standing around the outlet. Those whips are going to grow into trees. On Saturday this too was a cheerful scene. Some of the whips are already showing leaves. Over the next few years, let’s watch as the creekside patiently recovers. News, background info and opportunities for the public to help are all at sausalcreek.org. Once upon a time there was a thriving native encampment near the head of San Antonio Slough, tucked under bountiful oak trees in a valley with a permanent stream. Then the padres of New Spain put the natives behind walls to earn their bread with the sweat of their brows, and a generation later the Mexican rancheros converted them to secular laborers. The valley, which took on the name Indian Gulch after the Indians were gone, has remained significant. The property line between the lands of the Peralta sons, Antonio on the south and Vicente on the north, ran directly up its streambed. 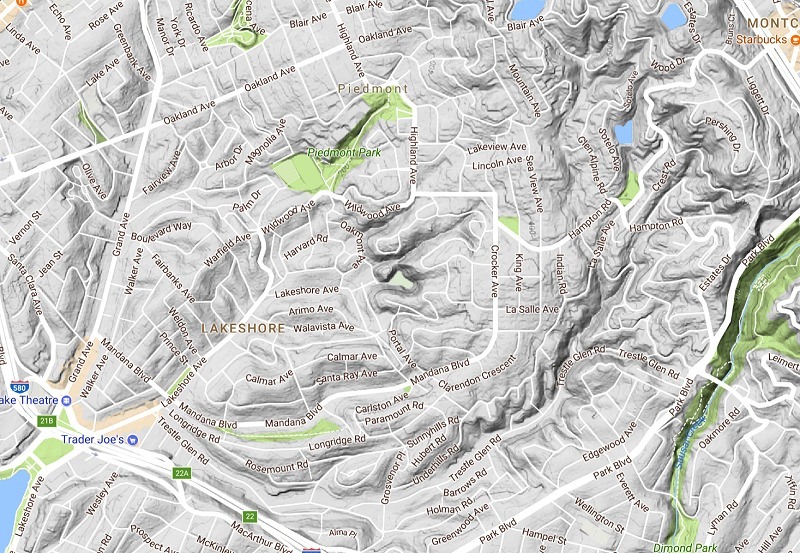 On the map, the valley with its tributaries looks like a long feather, arcing across the bottom of this map from Lake Merritt (the former slough) into the hills of the Piedmont bedrock block. Today the valley is an Eden of the suburban sort, well worth a walk for its natural and human sights. 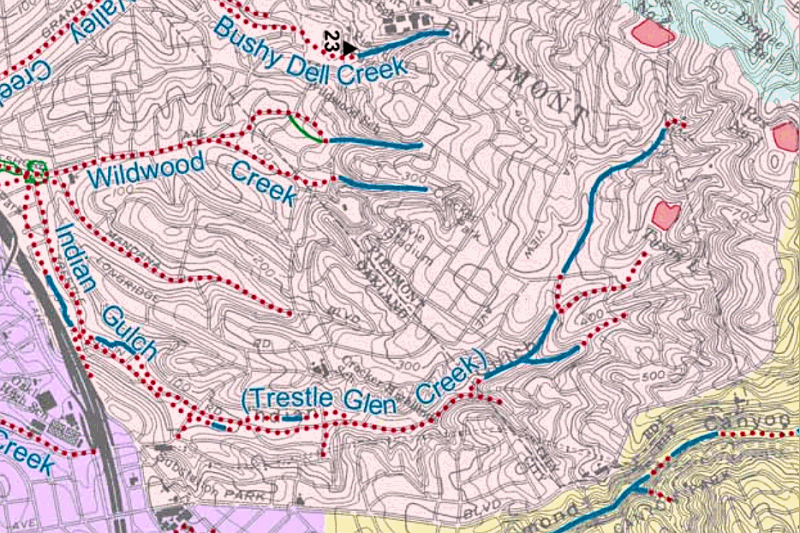 These sights do not include the stream, now called Trestle Glen Creek and mostly culverted or hidden in back yards. The lowermost part of the valley, going up Trestle Glen Road, has a very gentle grade, taking well over a mile to climb 100 feet. The sides of the valley rise a good hundred feet on either side. The stream here is at grade, meaning it has cut down about as far as it can. 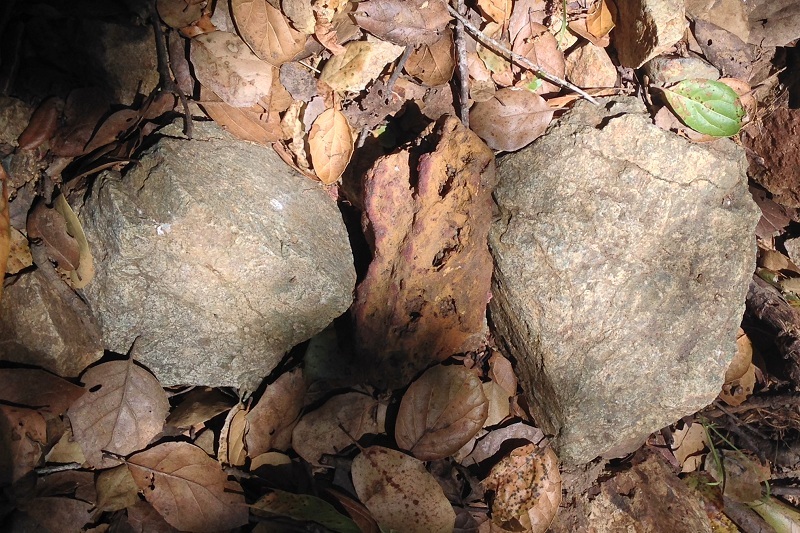 The ground it has eroded is the sediment of the Fan, not bedrock. 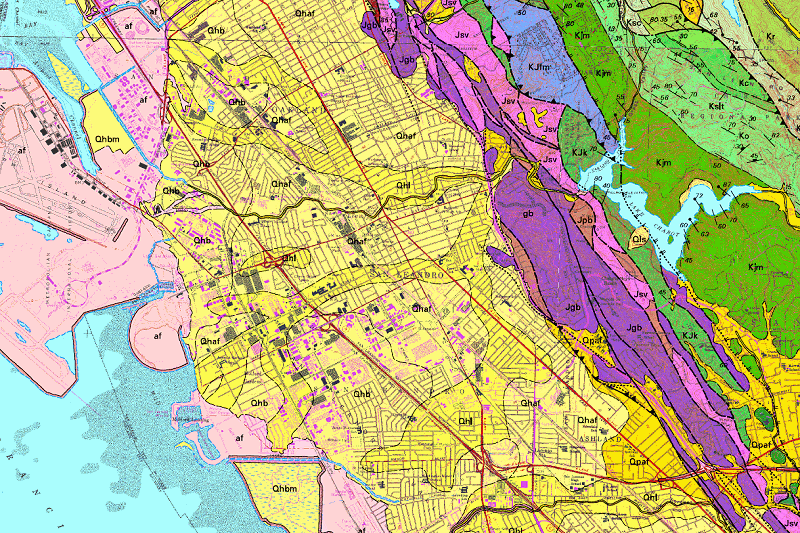 See it here on the geologic map. This stretch of the valley ends just past Norwood Street as we enter bedrock country. The grade steepens slightly, and the valley walls close in a little. The power line towers in the back of this view sit on bedrock. Two very unobtrusive footpaths lead from here to either side of the valley where you can encounter the bedrock. The one on the south side is particularly discreet; you might have better luck coming down from Park Boulevard via Elbert Street to see this exposure. It’s your standard Franciscan metasandstone, the same stuff that was quarried in Piedmont before it incorporated in 1907. There’s also a nice exposure on Trestle Glen Road a little farther up. By now the valley has gotten distinctly narrower and steeper. Right at the city line at tiny Valant Place, Trestle Glen Road leaves the streambed and climbs up to Park Boulevard. 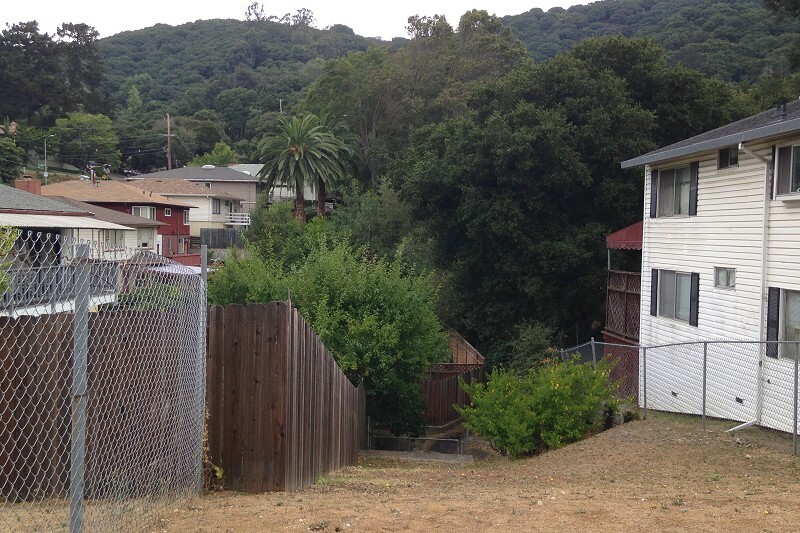 Seen from Valant Place, the valley is a real ravine now. You can’t walk up the valley any farther; it’s all on private land. 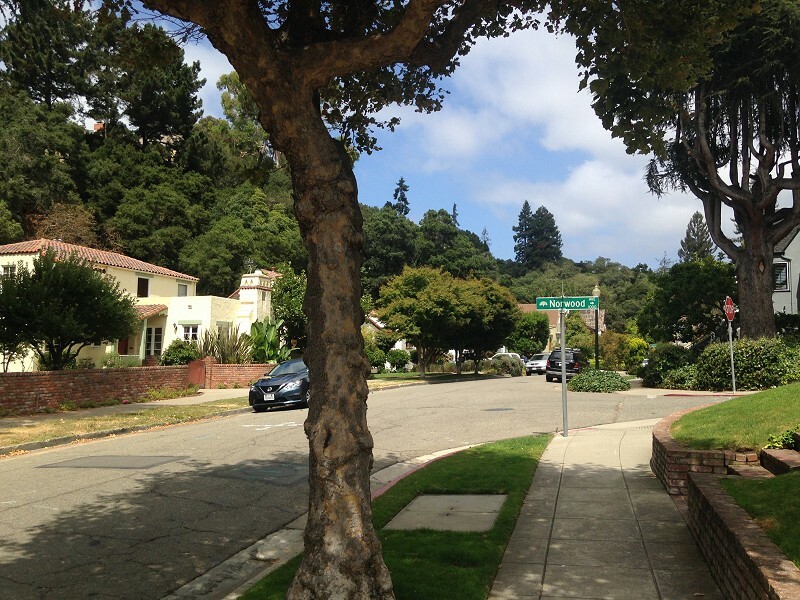 But from the Piedmont streets that flank the valley — Indian Road, La Salle Avenue, St. James Drive — you can catch glimpses of the living stream. 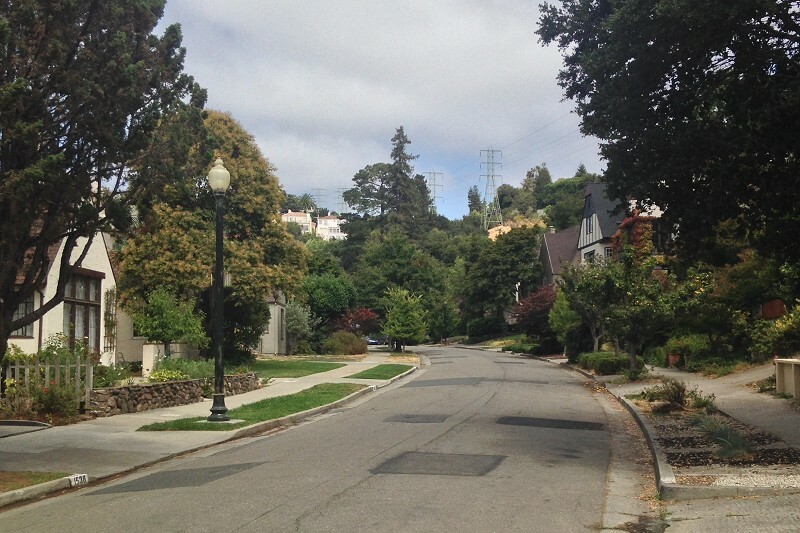 The Uptown to Montclair ramble I posted a few weeks ago goes through higher parts of Indian Gulch. But the longest stretch of the unspoiled stream, the western branch, is totally secluded in private hands. That branch is where the rancho boundary went. You can spot it from the 33 bus, on Hampton Street, if you know where to look. So is this a glen, or is it a gulch? Both terms refer to small, steep-sided valleys with running streams in them. However, a glen is typically wooded — the word comes from the Gaelic — and implies a green, secluded place. A gulch not only has steep sides, but also a steep slope with a rushing mountain stream, and the word is widely used in the Southwest. 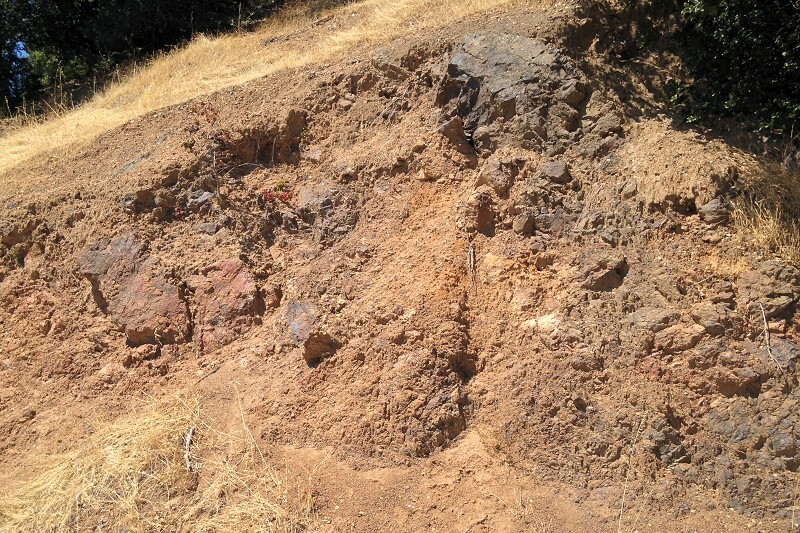 A gulch is forbidding, but, especially in California, it’s well suited for gold panning. This valley offers both wealth and seclusion today, so I call it a toss-up. Once upon a time, we used to produce a lot of our water from local wells, but for the last century we’ve retired them as the aquifers were drawn down or polluted. So I’m always surprised and intrigued to see wells still at work. This is on Willams Street in San Leandro. 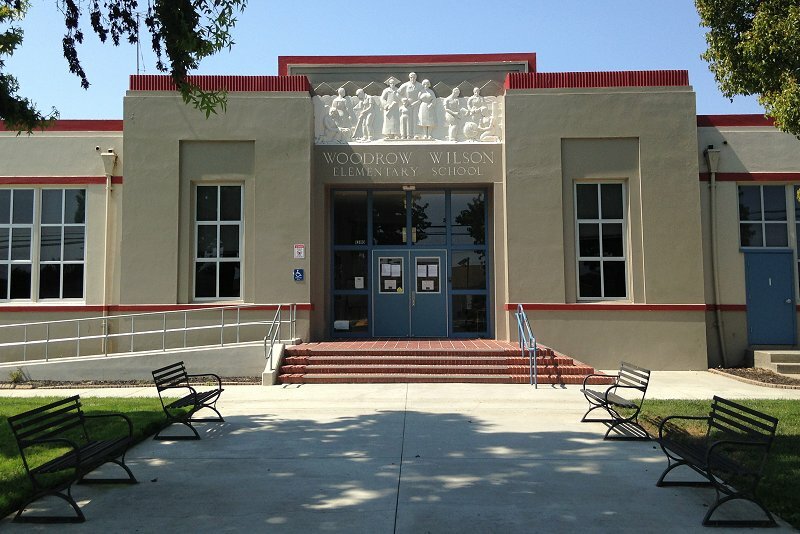 The location is a big educational complex comprising John Muir Middle School, San Leandro Adult School, and Woodrow Wilson Elementary. 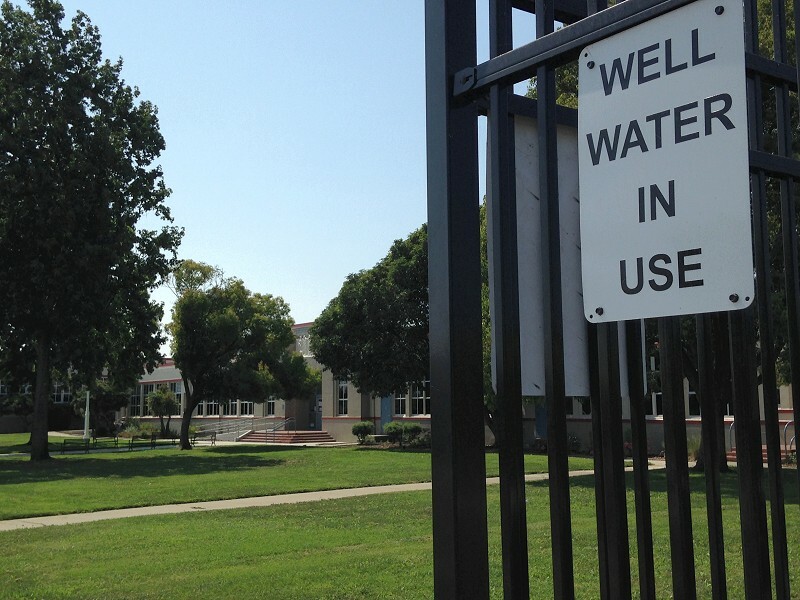 Presumably the well is for watering the grounds, not supplying the drinking fountains. Qhl stands for “Quaternary Holocene levees.” The Quaternary Period includes the last 2.6 million years of Earth history, and the Holocene Epoch is the final portion of the Quaternary, the time since the glaciers last melted. I think of the Holocene as the geological present. Levees form when floods regularly spill over a riverbank — the moment rushing floodwater leaves the river, it slows down and immediately drops most of its sediment load. Repeat this enough times and a low rise builds up on both sides of the river: a pair of levees. 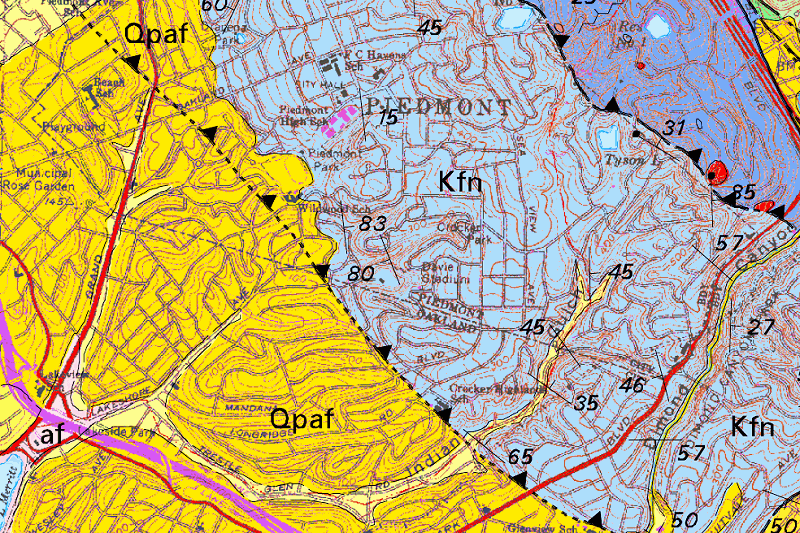 The map explanation says about Qhl, “these deposits are porous and permeable and provide conduits for transport of ground water. . . . 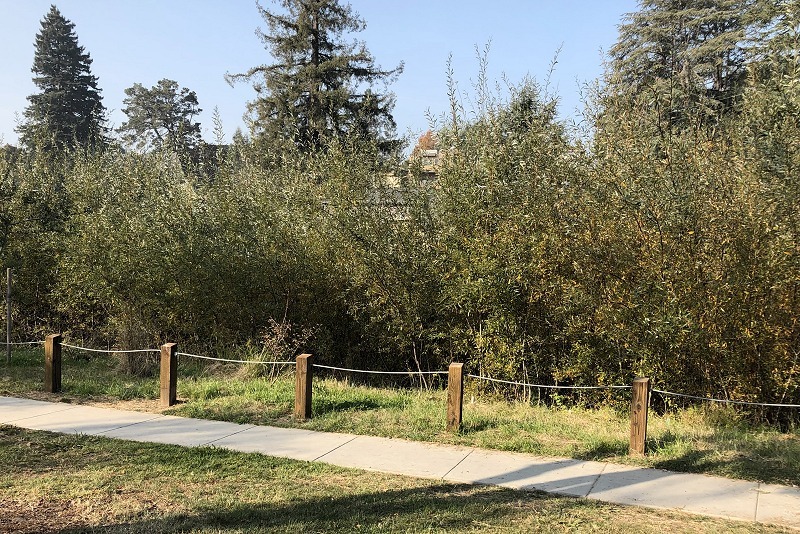 Abandoned levee systems have also been mapped.” And that explains the well water of Williams Street — the street runs right down the middle of a former course of San Leandro Creek. Here’s a closeup. 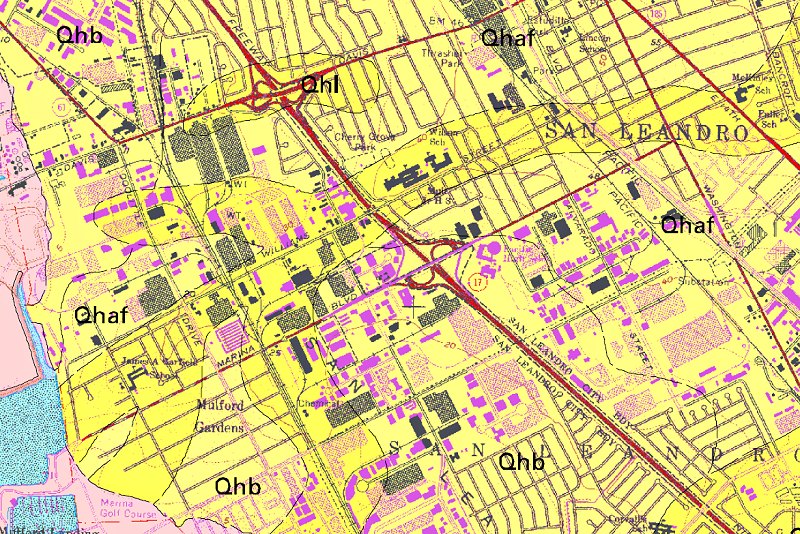 The map shows that the Qhl unit coincides with an extremely gentle rise in the ground about 10 feet high and a quarter-mile across. Natural levees are rare to see, because humans build them up higher for “flood control,” but you’ll easily see the rise if you walk away from Williams Street a couple blocks and look back at it. 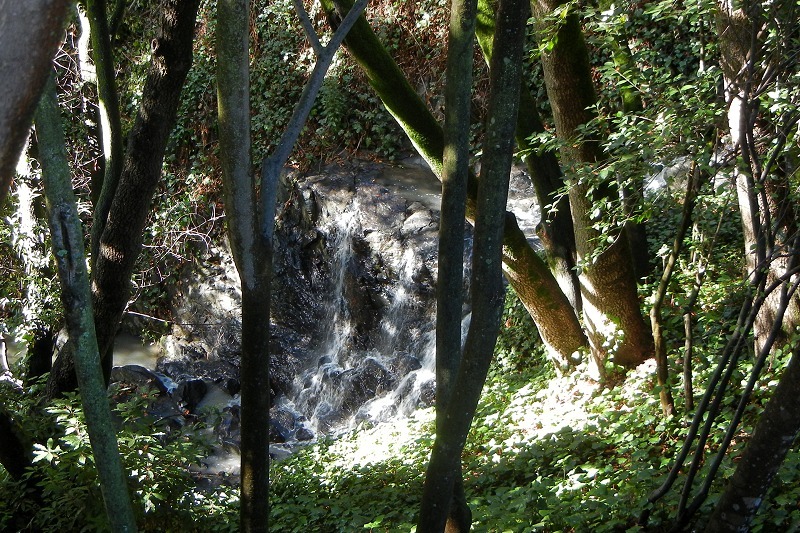 So San Leandro Creek once ran this way, must be thousands of years ago. Something perturbed it enough to cut a new streambed in another direction, and this abandoned course filled in. But it still carries water underground. 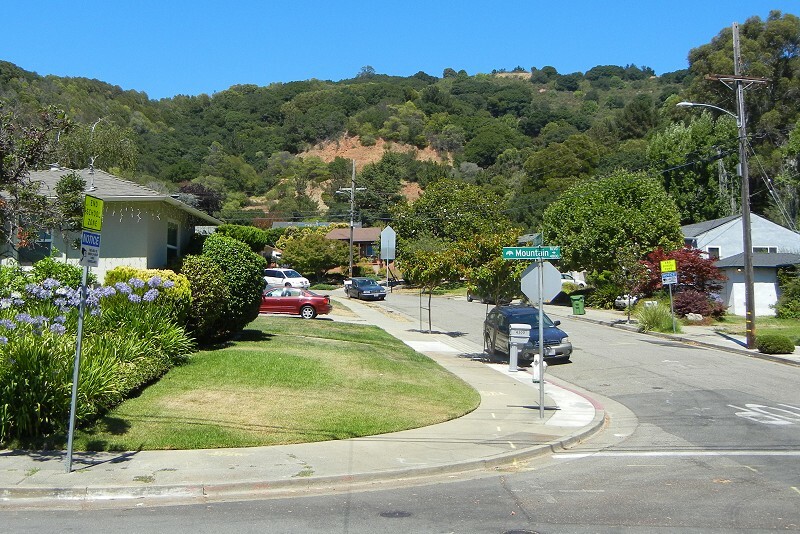 The northernmost finger of Qhl in the San Leandro Cone leads to the former site of Fitchburg, where a major wellfield once supported East Oakland with groundwater. 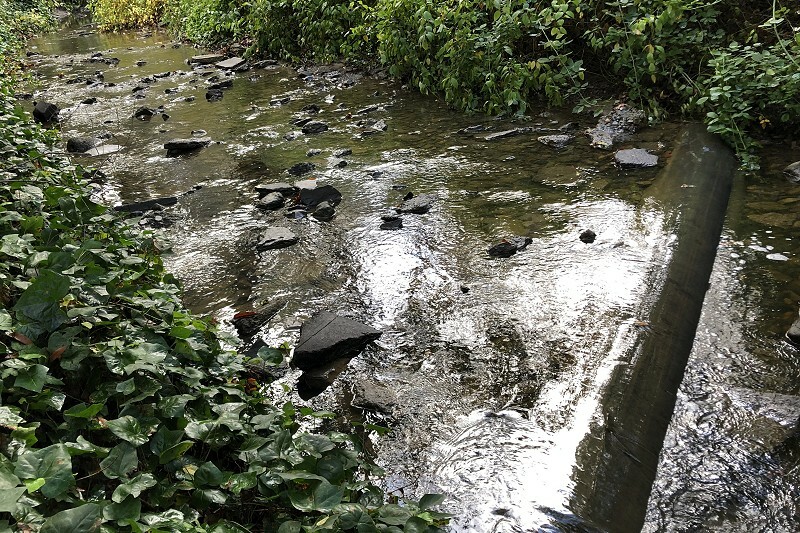 Last week I lingered over Leona Creek, in the Leona Heights area, but there are three other streams in the land between Horseshoe Creek and Chimes Creek. 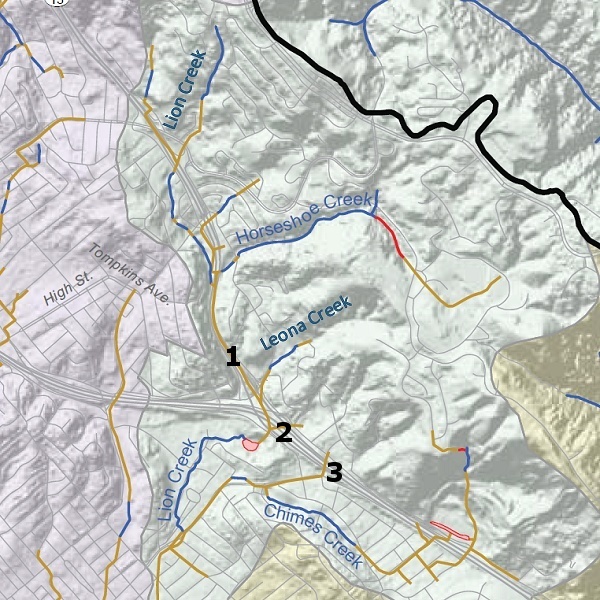 I’ll label them on the watershed map from 1 to 3, putting the numerals where they enter culverts. Creek 1 passes through the old Crusher Quarry grounds, now occupied by houses, so I’ll call it Crusher Creek. This is the best view I can find of its catchment, looking across Mountain Boulevard up Bermuda Avenue to the quarry’s old working face. The headwaters are to the right, and I haven’t explored there yet. 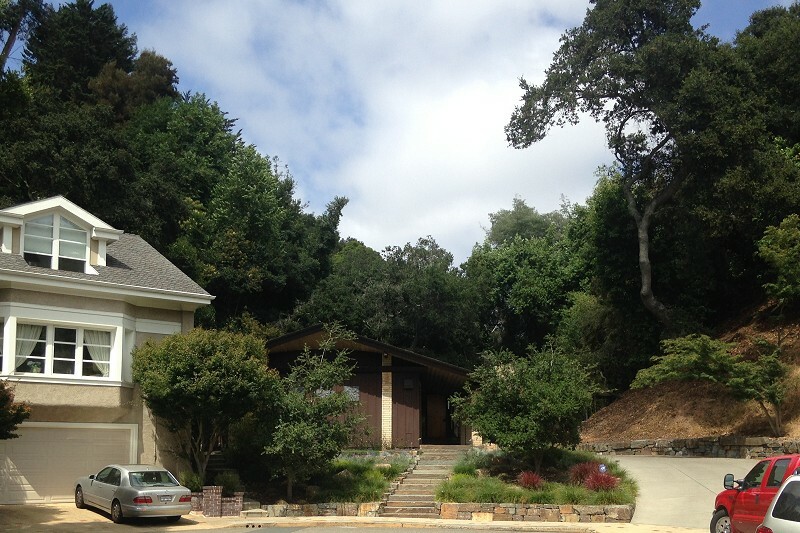 Behind me, the creek emerges in a steep gulch that passes around the old Chabot Observatory (now a school), then disappears under route 13. At the moment it’s all dry, so I can’t tell what shape Crusher Creek’s water is in. Probably not so good, considering the amount of sulfuric acid being weathered out of the old quarry leaving all that red iron oxide behind. Under the freeway Crusher Creek joins the orange water from the Leona Sulfur Mine, seen here where Leona Creek enters its culvert at Twitter Court. 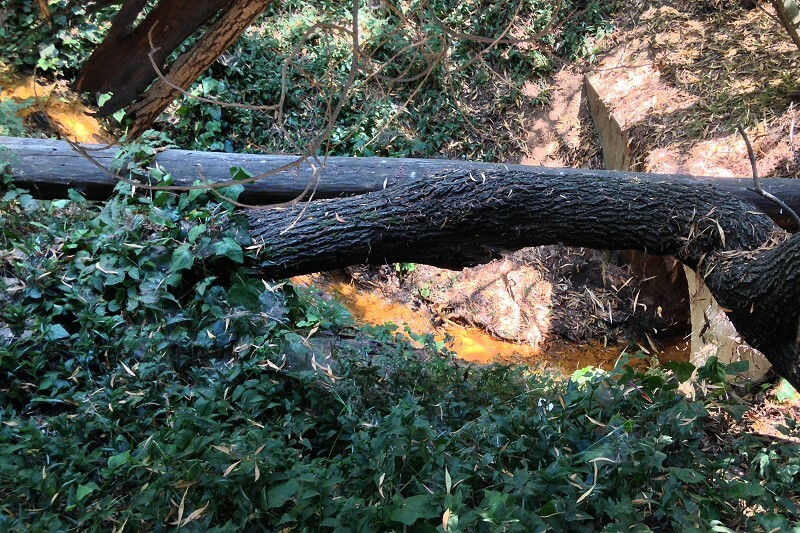 Creek 2 comes down next to Rusting Avenue, so I’ll call it Rusting Creek. This is not to prejudice its water quality, which is good where I’ve seen it. 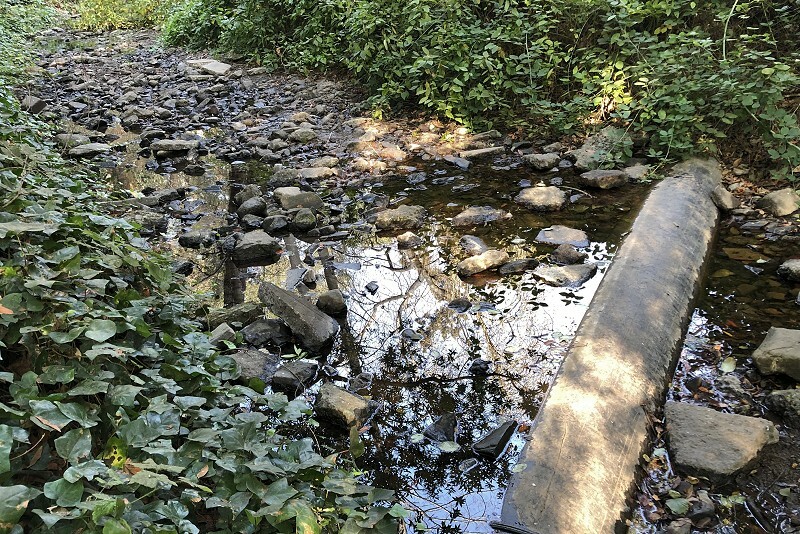 This view shows the entrance to its culvert at Mountain Boulevard, looking up its catchment. 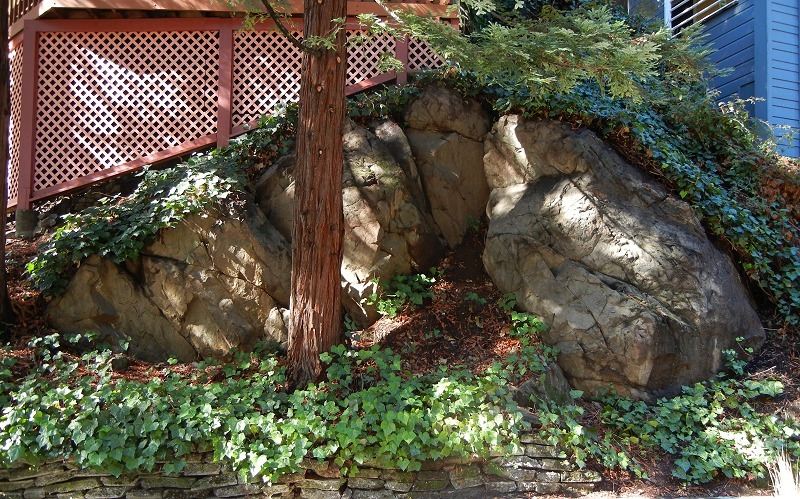 Higher up, just above Mountain View Avenue, the streambed displays the variety of rock that comes from the Leona volcanics, in a spectrum from nearly white and greenish-gray to dark red. 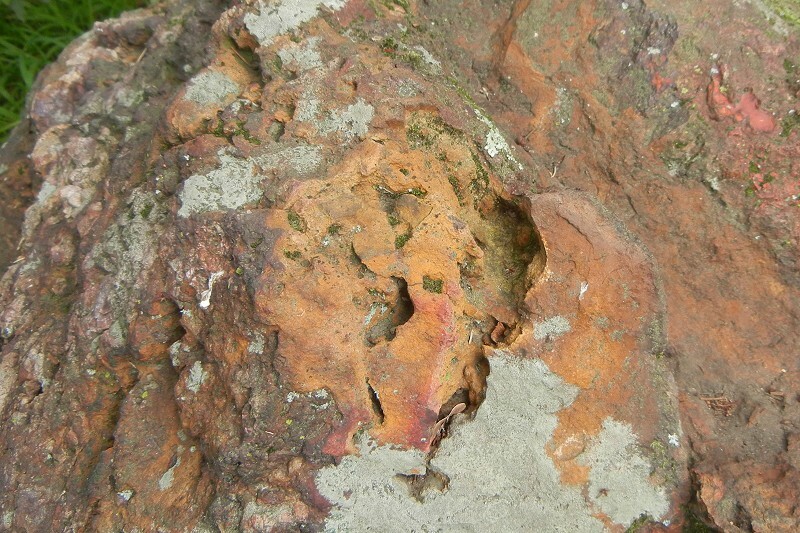 Here are two hunks of the pristine rock with a piece between them of the ocher crust that forms on top of it after centuries of weathering. Creek 3 has a fire road up its valley, behind a gate at the end of Leona Street, that used to be called Russell Avenue, so this is Russell Creek. It’s worth an outing, as long as you park down the road and walk in quietly. 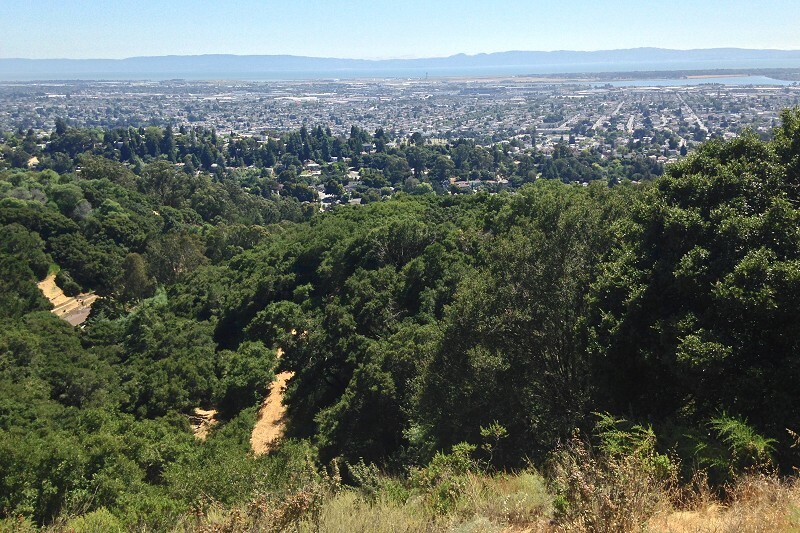 However, at the top the fire road ends at a locked gate on Ridgemont Drive, and you’ll have to walk back down. I can attest that trying anything else is foolhardy. 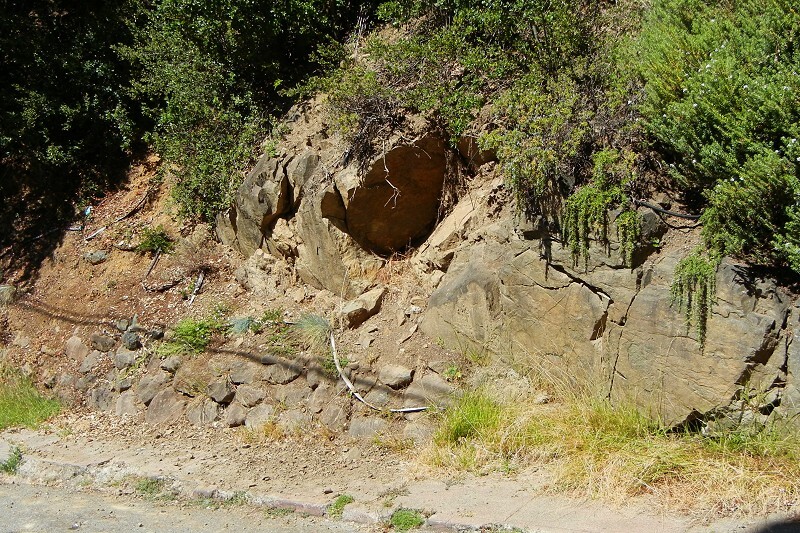 The rocks exposed along the fire road show the full range of the Leona volcanics. Close up, they’re quite colorful with their oxide skins, and there are many fine oaks and vistas along the way. 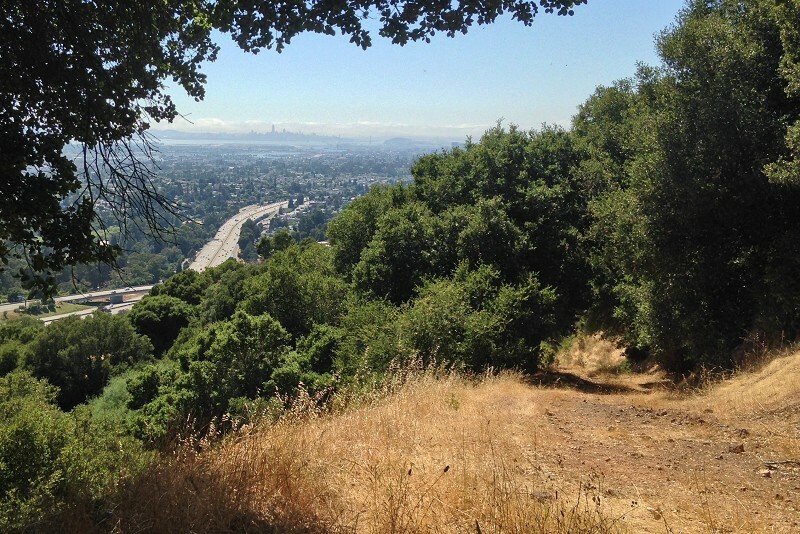 This may be Oakland’s best trail you never heard of. Finally, from Leona Road you can take a fire road to the former Leona Quarry, now called “Monte Vista Villas at Leona Quarry” and filling up with townhomes. 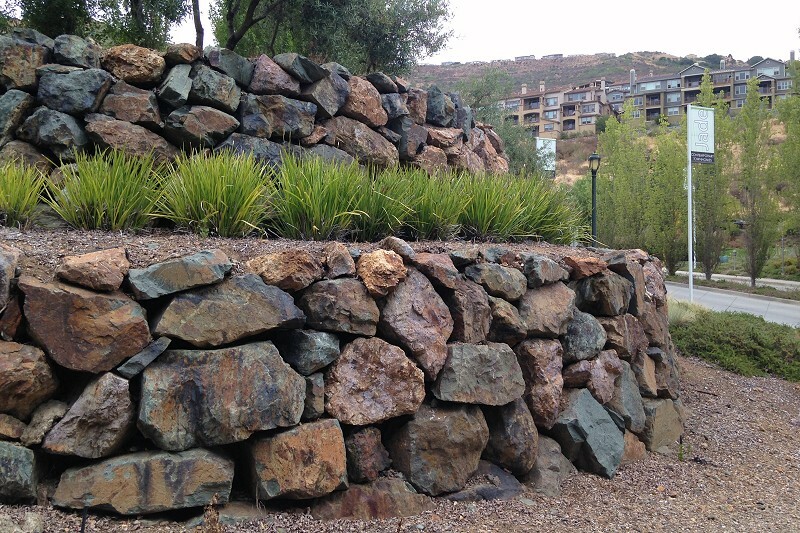 I can’t easily describe how to access it except to recommend you take it first from the other end, at the entrance to the development next to this fine wall made of quarry boulders. It leads along the freeway and ends at a nameless spur off of Leona Road. 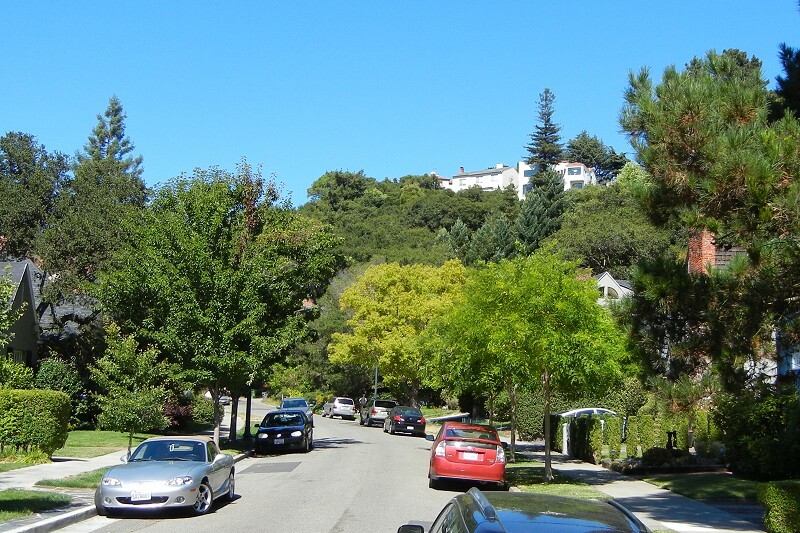 The stroll is nice, if you ignore the freeway noise, and you’ll see that the hillsides here, which look so tempting from a distance or from the seat of a car stuck in traffic, are quite inaccessible. Stay on the path.